You're gonna be bothered by how cool I am. First, and most generally, believe the hype. It is phenomenal, truly. Even if you have read the playscript (of which there are two versions now available, the rehearsal version and the final version), you are still going to have your face rocked off. I am very curious to see what happens with the Tony nominations next week (HPCC *just* got in before the eligibility deadline). It's not exactly Eugene O'Neill or anything, but it's such an immersive, breathtaking experience, and I absolutely see what JKR meant when she said it could only have been done as a play. Just reading it doesn't compare. And a movie version, where everything is CGI, wouldn't have been nearly as impressive. BNATPSYCHO 18 -- Cinemaniacs Assaulting and Killing (Metaphorically, of Course) for Thrills! I had seriously planned to do a vlog this year instead of a long breathless post, and I took a bunch of video, but my taciturn nature led me to shoot a lot more things and places than people (not wanting to bother people, natch -- #shypeopleproblems) so while I do have more pictures than usual, I wasn't quite ready for a vlog. Maybe next year. Thanks to Harry for letting me be part of this movie lovefest again. Thanks to David for giving me a place to crash. Thanks to the Drafthouse and Kristen Bell for making it all happen. And thanks to all my fellow BNAT-ers for the hugs and the discussions and the squees and OMG WE'RE GOING TO BE IN STAR WARS YOU GUYS! For the third straight year I schlepped up to the Alamo Drafthouse in Yonkers for their annual horror marathon. I had been torn, because the Nitehawk had a pretty awesome lineup (which they announced well in advance), but the two events overlapped and I had to choose. Ultimately, the Nitehawk's event cost more than twice as much as the Drafthouse's and I decided to trust to the Alamo's surprise programming. My expectations for awesomeness were somewhat lowered, since the programmer for the last two events was now the programmer for the Brooklyn location and wouldn't be involved. But it turns out I needn't have worried. As usual, they didn't announce the titles, letting us find out what we were seeing only when the title appeared on screen. Another great year, and I wonder if the Brooklyn location will join the fun next October. 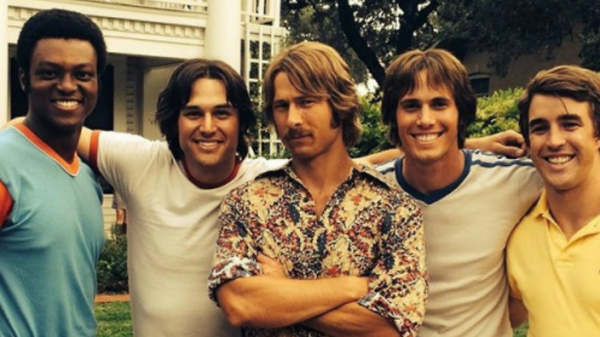 I've been harumphing about Richard Linklater's latest movie, Everybody Wants Some!! (yes, that's an on-purpose double exclamation), since I saw it last weekend and I get even more surly about it the more people heap praise on it. Maybe it's just that this movie is very much made for a group of people that doesn't include me, but I Just. Don't. Get. It. I'm a HUGE fan of Linklater. His "Before" trilogy is some of my favorite filmmaking EVER, and I have always been enamored of Dazed and Confused, which is the movie Everybody Wants Some!! is supposed to be the "spiritual successor" to, according to apparently everyone who has eyes or something. But for me, Everybody Wants Some!! is several steps backward for Linklater, and comparing it to Dazed and Confused is a superficial judgment at best. an Instagram post lost in its own nostalgia glow. There are loads of problems with this movie, starting with its rather dull and forgettable lead actor and the fact that I can't for the life of me remember most of the characters' names. (I remember McReynolds because I mused that he must have been nicknamed that due to his amazing Burt Reynolds-esque mustache.) But above all else, the movie has two Big Problems. I'm still as in love with JKR as I ever was, but this is the first time she's released information where I wish she hadn't. And I look back on how much we all wanted the HP Encyclopedia, and I'm glad this new info is only on a website (and somewhat easier to overlook/ignore) than if it were in print in a bookstore. The North American wizard worldbuilding -- what little I've seen of it -- is kind of embarrassingly bad. To the point that I'm still half waiting for it to turn out that she didn't actually write it. (I *cannot* believe she wrote the phrase "as dim as she was pretty.") As a white person, it's not my place to talk about the portrait of Native Americans, but that and the religious persecution element (and probably more that I haven't looked at) seem grossly under-researched. This makes me very nervous about anything else she might be planning to release about magical history in South America, Asia and Africa. I wonder if any backlash she might get on this might make her rethink it. I swear I'm not one of those people who thinks she should just shut up and not give any more story beyond the seven books. I've loved the little bits of extra character backstory and details that were part of her worldbuilding and just couldn't fit into the books. But this recent string of updates have literally nothing to do with the plot or characters of the books and it doesn't really add anything to them. This is not a series that really needed a Silmarillion. I've gotten away from watching trailers much at all, and this latest super-hyped trailer for Civil War reminds me why. Did we really need to see Spidey? I also have to echo something FilmCritHulk said today -- that it's difficult to buy that the world is tearing itself apart over Bucky Barnes when we care so little about him. Yes, I know Bucky is Tumblr's "precious cinnamon roll," but honestly I'd forgotten who he was by the time Winter Soldier came out (and I know I'm not the only one). On an unrelated-to-anything note ... what is with this new trend of the kids calling their faves "daddy" or "my son"?! I mean, when I was in high school I crushed pretty hard on Kevin Costner. I can safely say I did *not* want him to be my dad. "My son" is maybe a *little* more understandable. Maybe. At least coming from someone my age, or if you're actually older than the person you're talking about. I don't know why a 19-year-old wants to call 55-year-old Bradley Whitford "my son." I had not been holding out great hopes for this movie. I'd seen the "sloth" trailer a couple of times, and it was great, but I've seen a lot of movies with talking animals (as, I imagine, have most of you) and I wasn't entirely sold. Mostly it had to do with what I thought was going to be an overabundance of pop culture references and a lack of timelessness, which for me separates a lot of these more modern animated movies from my beloved classics. I should have remembered that, in addition to the classic fairy tales of Tangled and Frozen, this is also the studio that has given us, in the last few years, the amazing Wreck-It Ralph and Big Hero 6 -- both of which I was just as skeptical about in the beginning, but which became instant favorites. 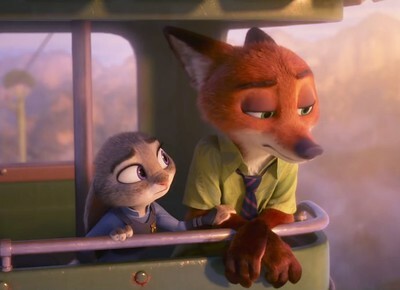 Zootopia is definitely a worthy successor to those. Gah, I wish I had time to do proper reviews like I used to, but I always dawdle until it feels too late and then I have like half a dozen movies I want to write about! I'm so rusty at this! So here are some brief (for me) thoughts on a bunch of movies I've seen the last couple of months. 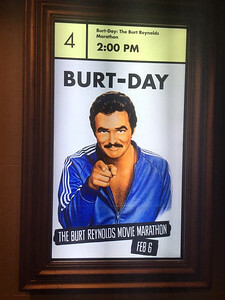 It's always a long schlep to the Alamo Drafthouse in Yonkers, but it is usually worth it, and their Burtday was no exception. In celebration of the man's 80th birthday (which is today! ), programmer Cristina Cacioppo had picked five of his films and a bunch of clips to show during the seating and the breaks. Just like previous marathon events (and like BNAT), we didn't know what was going to play (Cristina doesn't even announce the titles when she introduces the films, so it's a mystery until the title pops up on the screen). I was fairly certain we wouldn't see Smokey and the Bandit; as arguably Burt's biggest movie, it was too obvious a choice. I also didn't expect to see his Oscar-nominated turn in Boogie Nights, which is not so much a Burt Reynolds Movie as a movie that happens to have Burt Reynolds in it. And the only hint we'd been given was that one of the films was one that he had directed, so that narrowed it down to four. Such a great day, and so much Burt greatness. 2016 is all downhill from here. I'm not sure why I'm posting this here instead of Facebook, like everything else nowadays, but it just felt like it belonged here, you know? About ten years ago, when Rickman was doing the play "My Name Is Rachel Corrie," Kevin Smith was visiting him and Rickman told him that he'd finally broken down and bought an apartment in New York. It was in the same building as Ralph Fiennes, and they were both desperate that no one ever find out, because if Potter fans found out that Snape and Voldemort lived in the same building, the response would be out of control. This year's movie-watching is shaping up to be better than last year's, number wise (final tally was 240, counting vintage and rewatches), and as usual, my attempt to do a top 10 changed very quickly into a top 20. I'd really like to do a full and proper review of Star Wars: The Force Awakens, because I have loads to say about it and very consciously did NOT include it in my top 20 (no way I can rank something like that, nostalgia too high). I've also done separate lists on my favorite film discoveries and my favorite females in movies (as this year has been a better year than most for women). But before I get into the main list, here's a rundown of the rest.